Simplicity is the key to successful terminal rigs for shore fishing. It’s easy for novices to become bogged down in the technical aspects of rigs, and terminal tackle is one area where the armchair experts excel. 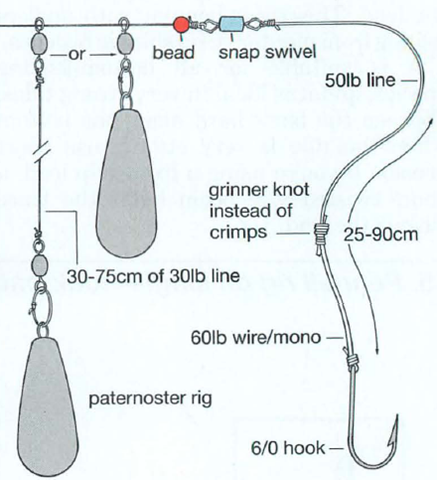 Complicated combination rigs may look fine on paper or hanging from a rod tip, but they often turn into a tangle of monofilament when they hit the sea bed. That is not to say that they can’t catch any fish — they can. However, a more balanced and efficient rig may help you to catch more. With the exception of a float-fishing rig, terminal tackle should put the bait directly on the sea bed – where most sea fish feed. It should also be streamlined to aid casting, and strong enough to withstand all the rigours of casting and the rough, snaggy underwater features of some venues. At rocky venues such as this in Devon, the weak-link rig (or rotten bottom) in a single paternoster is your all-round best choice, but keep the hook length short to try and minimize tangles. The line of the rig is put under tremendous strain when you cast, so it must be the same breaking strain as the shock leader. 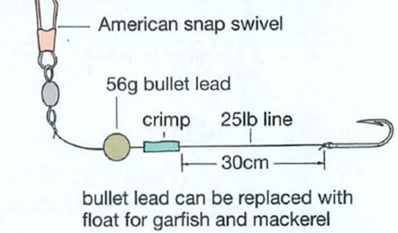 An excellent rule of thumb is 10lb (4.5kg) of line for every ounce (28g) of lead. Go under this guide and you risk the line snapping and causing injury – possibly death – to other anglers. Attach the leads with a link swivel or a clip. 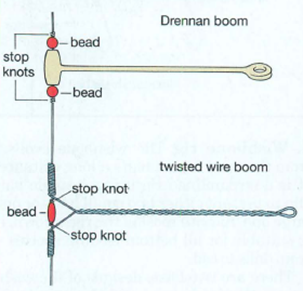 Tied directly to a lead’s eye, the line can be damaged when the lead is dragged up the beach. Check rigs regularly for damage from sand, rocks and shellfish. 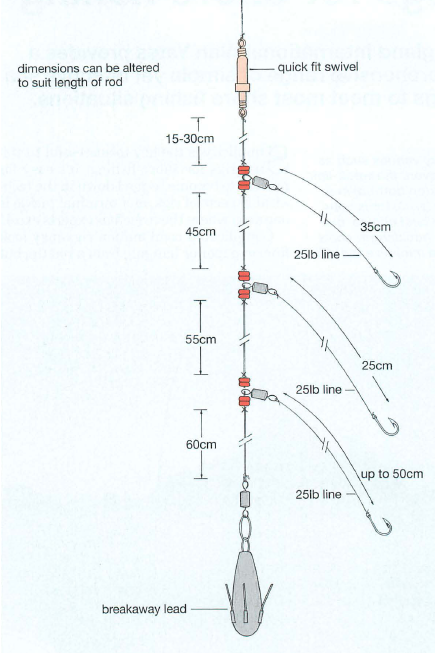 For the most part, hook snoods need be no lighter than 20lb (9kg) b.s., with 25lb (11kg) the most suitable. If you are using light lines for flatfish, for example, use booms. The danger of using very light hook snoods is that strong tides can twist and damage them. The following 10 rigs offer a comprehensive combination to cover most sea angling situations for most species. By placing them in a custom-made rig wallet and labelling them accordingly, you can store them efficiently – and also keep them relatively tangle-free. 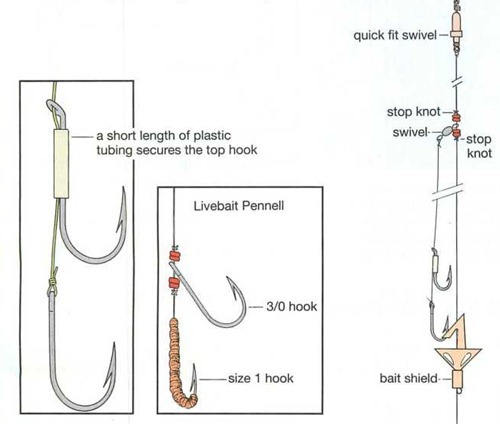 A single hook paternoster with bait clip (rig shown) or a wishbone rig cuts through strong wind, getting your bait to the target area and holding it along the bottom – where most of the fish are. This terminal rig provides the overall design and construction for several other rigs. It can be used in one, two or three-hook variations, with a single hook most suitable when you’re fishing among snag-strewn ground. It’s the most popular shore rig because it is streamlined for casting, and the addition of bait clips aids this even more. Clip the snoods up or down towards the lead. Hook snoods are positioned along the trace by small swivels which are trapped by micro beads and mono or Impact Power Gum stop knots. Alternatively, you can secure the swivels and beads with wire line crimps or stops made from telephone wire. A proviso is that the hooks mustn’t reach the swivel and beads above or below; or they tend to get tangled. The bait clips hold the hooks and bait close to the main line, making the rig more streamlined. The rig’s dimensions, including snood lengths, can be altered to suit the conditions. For example, anglers fishing for dogfish prefer short snoods rather than long ones simply because they reveal bites sooner. But cod anglers prefer long snoods to allow the fish to take the baited hook deeply into their mouths before they move off. 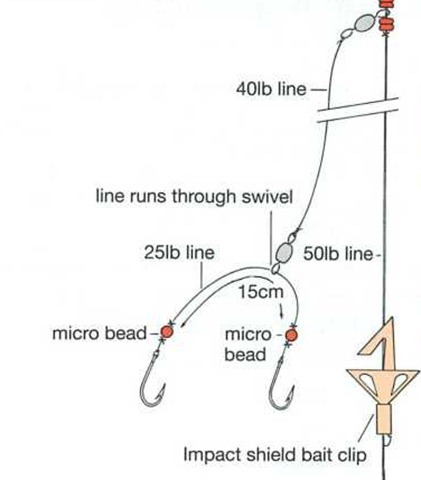 Increase the length of snoods to ensure the baited hooks reach the sea bed – this is especially important when you are fishing close in from high pier walls or cliffs. Impact Power Gum is available from most coarse angling tackle dealers. Freshwater anglers use it when they are feeder fishing. There are special soft crimps which are more suitable for monofilament line. Look for soft crimps which are slightly larger in diameter than the line you are using. Close the crimp with specially designed crimp pliers. Used by generation after generation of anglers, this rig is popular among novices when using a single hook. The fact that it allows a biting fish to pull the line through the lead, negating the lead’s weight, appears attractive to many anglers. But this offers little real advantage. In fact, a fixed lead is more effective because it helps to drive the hook into a feeding fish. Two hooks fish above the lead, and another hook, attached to a long trace, fishes below the lead. This rig is popular with anglers fishing from piers or steep shingle beaches. It is suitable for all bottom-feeding species, and it is ideal in very strong tides. 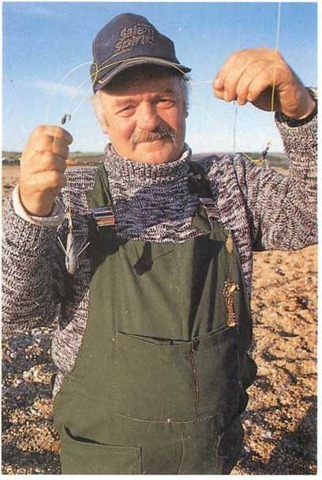 To keep the baits hard along the bottom when the tide is very strong, use short snoods. If you’re using a fixed-grip lead, a short twisted-wire boom holds the trace clear of the lead. This excellent shore caught thornback ray was taken from Co. Clare, Republic of Ireland on a two-up one-down rig. If you are going to make your own bait clips from wire, remember that the tubing and wire used must fit tightly on the rig’s line. Domestic lighting cable, size 1mm, is compatible with 50lb (23kg) plus breaking strain leader. 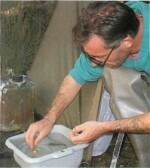 The wishbone evolved from the need to cast baits a long distance. It is a streamlined rig using a single bait clip to present either two small baits or one large one. As with most of the rigs shown, it is suitable for all bottom-feeding species – from dabs to cod. There are two basic designs of the wishbone – the fixed-snood and the swivel versions. Both are prone to tangle if used in slack tidal conditions. A Breakaway Impact shield bait clip, positioned slightly above the lead, is ideal for clipping down the hooks. The swivelling snood can be 60cm (2ft) long. The name Pennell refers to the inventor and only involves the layout of the hooks on the snood. Popular among bass, conger and cod anglers, the Pennell has two hooks instead of one — this provides an efficient way of hooking fish when large baits such as a whole calamari squid or many lugworms are used. On a simple paternoster the Pennell’s snood length can be up to 60cm (2ft). You can use it either on a paternoster or a flowing trace. Clipping the baits down at the bottom of the paternoster rig aids casting distance – but this is especially important if you have a large bait. 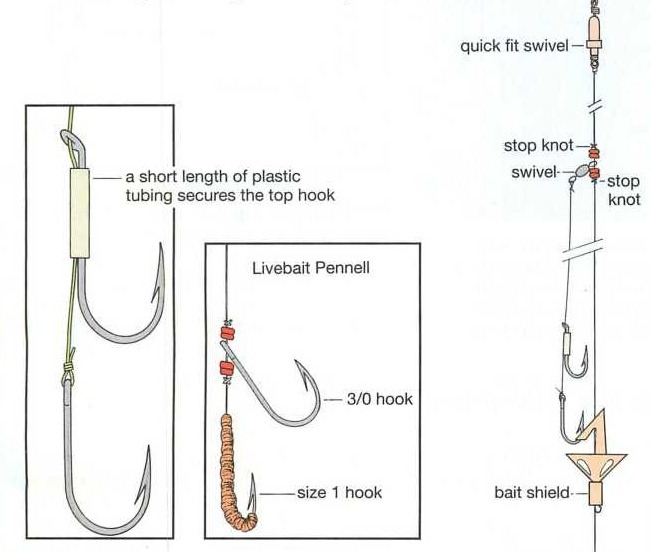 A type of Pennell rig is excellent when live-baiting for cod. Thread the hooklength through two beads, the eye of a large hook and two more beads. Attach a small hook. Put bait on the small hook, and cast out. You’ll soon pick up a small pouting or poor cod which is then left for a big fish to take, the big hook being free to hook the cod. The sliding-float rig is suitable for float fishing for garfish, mackerel and mullet — and in most situations. By adjusting the stop knot you can fish a variety of depths as long as you add weight to the rig a little way below the float. When fishing in shallow water for surface-swimming garfish, add a fixed hook above the float. 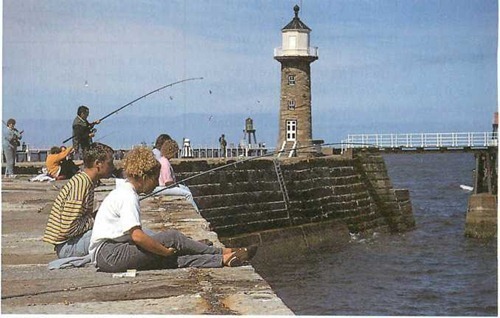 Mackerel and garfish come inshore in the summer and attract young and old anglers alike. Tackle mackerel with a sliding float-fishing rig, and add an extra snood for garfish above the float. The main advantages in using booms are that they distance the snood from the main line and that they enable you to use very light snoods which won’t wrap around the body of the rig and break off. 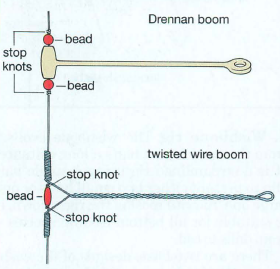 There are various types of booms; those made of twisted metal and plastic are the ones used most. This rig is good for single hook fishing over very rough ground such as heavy kelp beds or shallow rocky reefs. The lead is attached to a small open wire clip. After the rig hits the water, the lead falls off the clip. 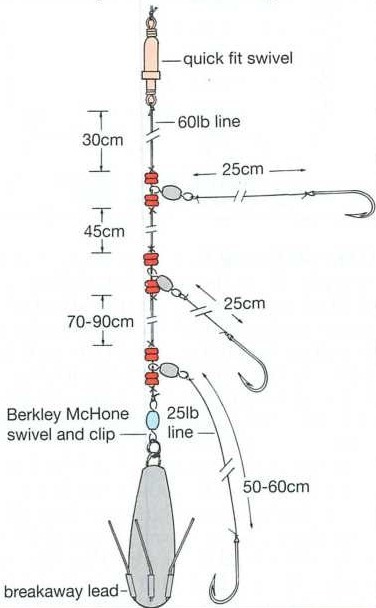 If the weight gets snagged on rocks, the light line breaks easily, freeing the rest of the rig. 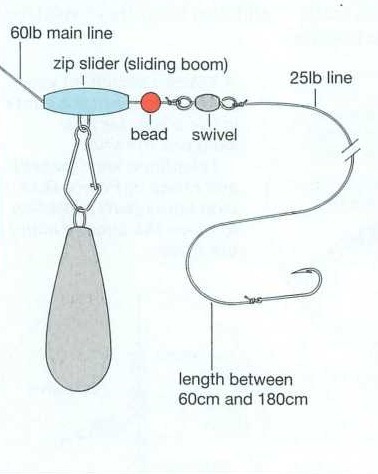 As its name suggests, this rig slides down the main line to provide a hookbait on the surface or in mid water for species such as pollack, garfish or mackerel. By adding lead to the snood you can fish it on the sea bed away from the main terminal rig for all bottom-feeding species. 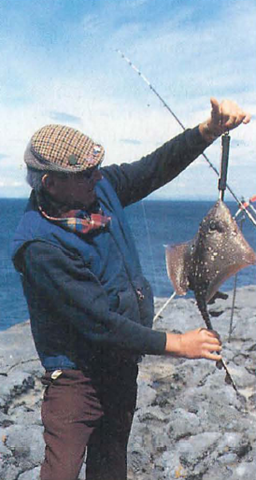 It’s ideal for fishing close-in for flounders or at long range for most other species. Include a float or a weighted hook on a snood that slides down the main line as far as the leader knot or the rig’s top clip. If using the rig in leger form, you need at least a 2oz (60g) lead to ensure that the bait reaches the sea bed. This rig isn’t suitable when you’re fishing in a strong tide or among weeds. For conger fishing use a large hook (6/0 minimum). 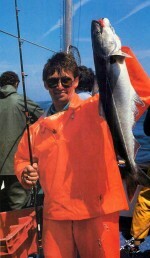 A wire or heavy mono length (100lb/45kg) stops the conger’s small but sharp teeth from biting through the hook snood. This is when the single hook sliding trace is suitable, although the sliding paternoster is more popular.